Eugenia Zukerman accepted our invitation to be Artistic Director in July 2016. in 2018 Classi cs on Hudson will present four concerts in partnership with the Hudson Hall at the Hudson Opera House, a multi-arts organization that offers over 70% of its events free to the public. We also offer two family events for children for all ages. As a parallel initiative, we formed a collaboration with the Montgomery C. Smith Intermediate School and the Bard College Music Conservatory to present school workshops under our Music Mentors Program. Each year we select five Music Mentors to work closely with a class of 140 sixth graders at MCSmith Intermediate School in a music appreciation workshop. Music Mentors will guide students in their growing musical literacy, instilling a sense of agency, discipline, and courage to help students create a musical narrative comprehensible and enjoyable for all. Classics on Hudson is the newest iteration of the non-profit that began as Columbia Festival Orchest ra, then became the chamber series ClaverackLanding, founded by Gwen Gould, whose tireless dedication to presenting great music brought a devoted following in Hudson and beyond. With a mission to explore great architectural spaces as well as great chamber music, ClaverackLanding presented events in Hudson, NY at Club Helsinki, The Hudson Opera House, The Hudson Armory, The First Presbyterian Church, Christ Church Episcopal, TK Gallery, and The Tin Ballroom, as well as at St. James Church and the Columbia County Fairgrounds in Chatham. 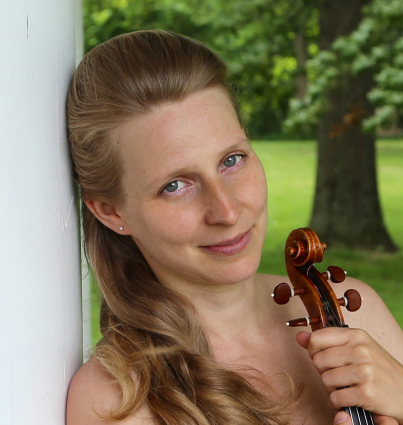 The gifted violinist and violist, Helena Baillie, served as co-director with Ms. Gould, the n principal artistic director, in our two formative years. London-born Ms Baillie was hailed by The Strad magazine for her ”brilliance and poignance,” and stands apart for a rare ease on both violin and viola. American Record Guide praised her ‘gorgeous singing tone’ in an album that ‘from the opening flourish will be a special recital.’ She enjoys a multifaceted career as a performer and violin faculty member at the Bard College Conservatory of Music Preparatory Division and at The Hotchkiss School. Classics on Hudson is very grateful for the generous underwriting of our 2017 and 2018 seasons from these corporations and foundations. Classics on Hudson has presented ten professional chamber concerts, four benefits with music performance, two community Messiah Sings with professional musicians and soloists, four family concerts; and two Spring seasons of our Music Mentors Program at the Montgomery L. Smith Middle School in Hudson.